Don’t you love the beautiful green color of this pesto with those wonderful flecks of pistachio nuts? 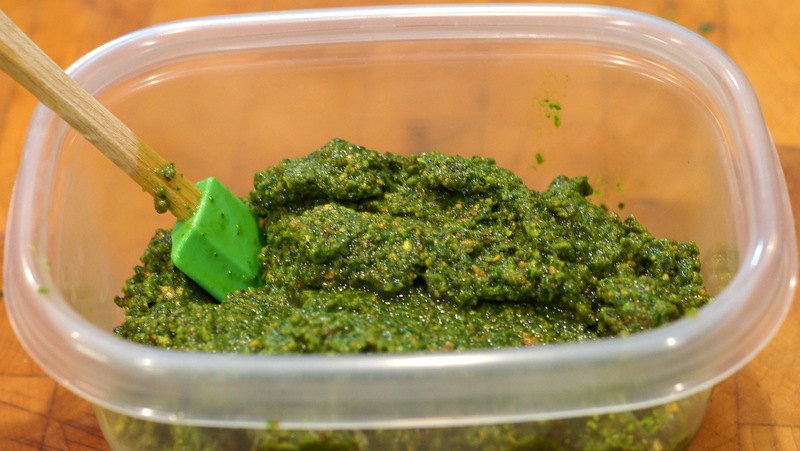 This is a fabulous variation on pesto that you really need to try. If you haven’t noticed, we like pesto. In fact, to date, there are 9 different recipes using pesto on the blog. This post will make an even 10. Pesto is such a versatile condiment that everyone should have multiple pesto recipes in their cooking repertoire. For instance, everyone knows that you can use pesto in pasta but it is also a wonderful finishing condiment for soup. We use it with fish, chicken and vegetables. It also goes well with lamb, pork and beef and makes an incredible sandwich spread, addition to salad dressing or topping for bruschetta. Again, only your imagination is the limit for your uses of pesto. For those of you unfamiliar with pesto, pesto is a sauce purportedly originating in Genoa in the Liguria region of northern Italy. It traditionally consists of crushed garlic, basil, and pine nuts blended with olive oil and Parmigiano Reggiano. The name is derived from the Genoese word pestâ, which means to pound, to crush, as this is the way it was originally prepared. 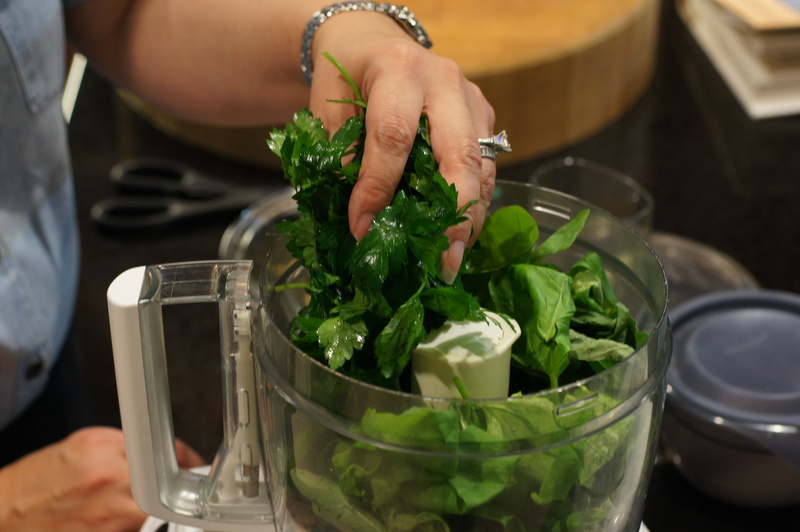 Nowadays, pesto is not made by pounding or crushing but with food processors, whiz, whiz… You can use the tried and true traditional method of pounding or grinding with a mortar with a pestle but why would you? There are certain marvels of the modern culinary technique that just flat out save time with minimal, if any, affect on quality of taste while improving texture. Because pesto is a generic term for anything that is made by pounding, there are various other pestos, some traditional, some modern. You have pesto alla genovese, the most common and generally thought of as the original pesto, that is made with genovese basil, salt, garlic, extra virgin olive oil, pine nuts and grated parmigiano reggiano. There is the traditional pesto alla siciliana that is made with tomatoes and parsley in addition to the ingredients in pesto alla genovese. 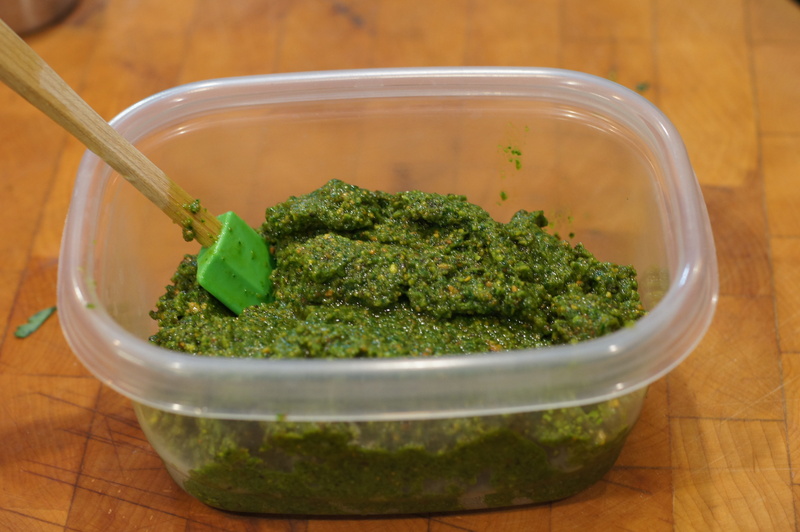 Another traditional Italian pesto is pesto alla calabrese that uses grilled red pepper for a more robust flavor. Outside of Italy, more modern versions of pesto use arugula, parlsey, mint, cilantro, sub-dried tomatoes, or spinach, etc. in place of or in addition to the basil. Cashews, walnuts, pecans, almonds, hazelnuts, pistachios, etc. are substituted for the pine nuts. The juice and/or zest of various citrus fruits are added for extra brightness. With the resurgence of interests in the culinary arts and better availability of quality ingredients throughout the world, “pesto” continues to evolve. This post uses pistachios in place of the pine nuts and adds some parsley in addition to the basil. The net result was a wonderful pesto with an incredible depth of flavor from the pistachios. We hope you give this a try. 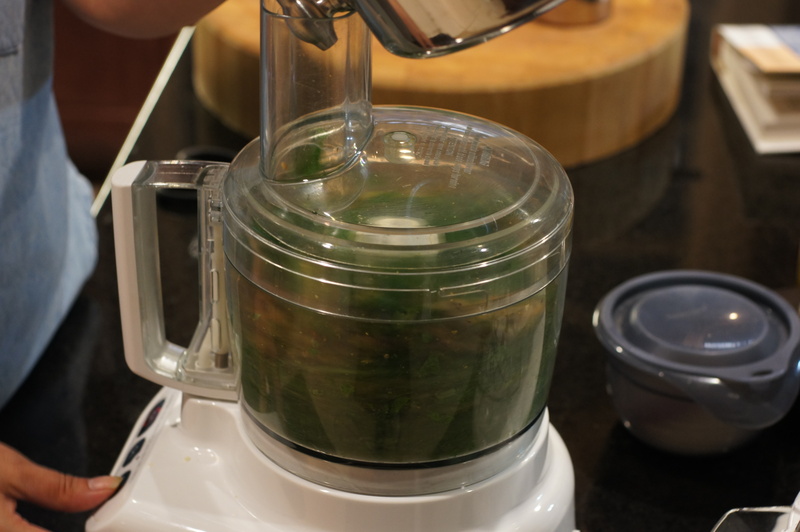 Add the basil, parsley, pistachios and garlic to a food processor. With the food processor on, drizzle the olive oil into the mixture continuing to process until the oil is fully incorporated and the nuts and garlic are ground. Remove from food processor and either use, cover and refrigerate or freeze. 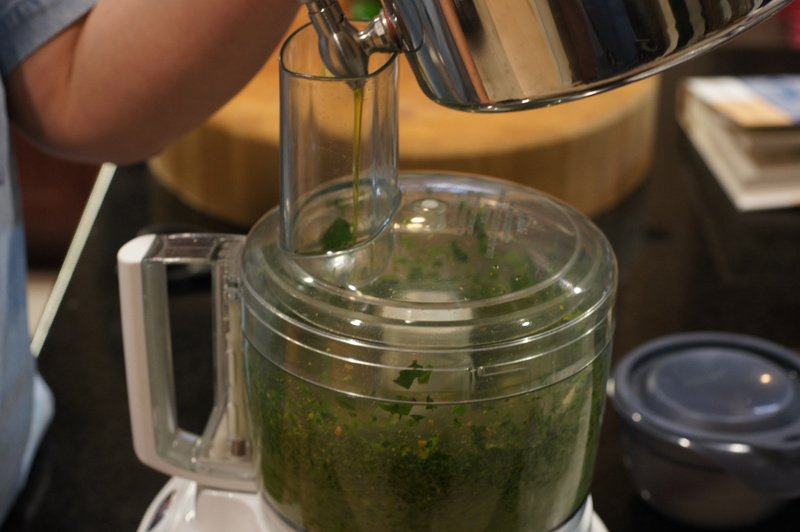 NOTES: As you can see, this recipe will produce a drier pesto. This was because of our intended use. If you want the pesto runnier, merely add more olive oil. Hi, Traci. Thanks for dropping by and your very nice comment. We hope to see you around. Hi, John. What can I say but that great minds think alike. 😉 This is a great pesto. Pistacchios is a nice variation that I’ll have to try. You also left out the cheese, which makes it even more different. I like to add both parmigiano and pecorino for a broader flavor spectrum. Good post! Hi, Stefan. Thanks for the nice compliment. The pistachio is a very nice change of pace and the nuts gave the pesto a nice creaminess despite the lack of cheese.